NEW DELHI — After about 30 years of waiting, the Indian Air Force (IAF) on Friday revived its decommissioned MiG-21 Bis aircraft of the Flying Daggers squadron and inducted two homemade Tejas light combat aircraft (LCA) plus one trainer aircraft built by state-owned Hindustan Aeronautics Limited (HAL) in Bangalore. The Flying Daggers squadron will achieve its full strength of 20 aircraft including four trainers in the next two years, according to a senior IAF official. Tajas aircraft will replace the MiG-21 Bis aircraft, he said. Defence Minister Manohar Parrikar said the planes will be a force multiplier. "Moment of National pride. 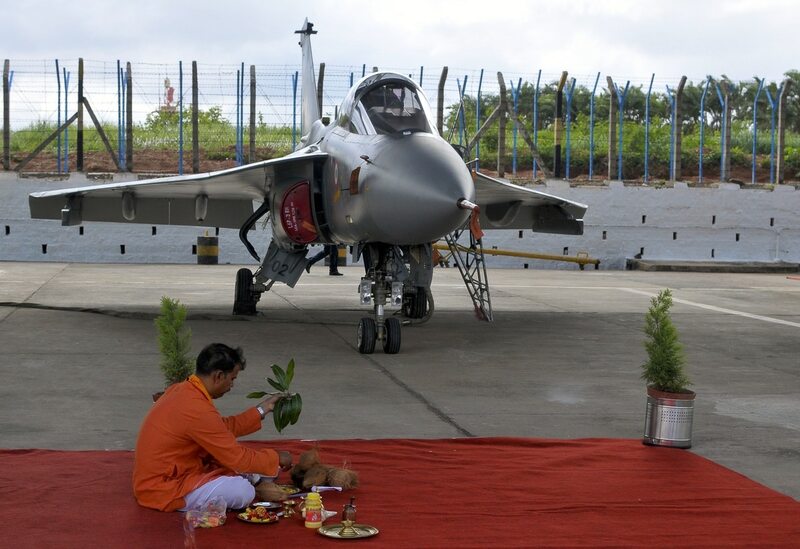 Indigenously developed Tejas fighter jet inducted into Air Force. Tejas will take our air strength to new heights," Parrikar wrote on Twitter. Moment of National pride. Indigenously developed Tejas fighter jet inducted into Air Force. Tejas will take our air strength to new heights. "Tejas is the first advance Fly-by-wire (FBW) fighter aircraft designed, developed and manufactured in India. Conceived as a MiG-21 replacement, the aircraft has been designed and developed by Aeronautical Development Agency (ADA) and produced by HAL, " an IAF news release said. Tejas is a fourth-plus-generation aircraft with a glass cockpit, and is equipped with a state-of-the-art satellite-aided inertial navigation system. It has a digital computer-based attack system and an autopilot. It can fire air-to-air missiles, bombs and precision-guided munitions, according to the IAF news release. So far Tejas has initial operational clearance (IOC) configuration, which it achieved in 2013, and the final operational clearance (FOC) is likely to be achieved in March 2017. The IOC Tejas aircraft is equipped with close-combat air-to-air missiles, a helmet-mounted display and precision-guided weapons. It is capable of dropping unguided bombs with accuracy due to its highly advanced indigenous mission computer. The FOC Tejas aircraft will incorporate beyond-visual-range missiles, improved and better standoff weapons, and air-to-air refueling capability. IAF is also pitching for additional LCA Mk 1A, which would incorporate new generation active electronically scanned array (AESA) radar with simultaneous air-to-air and air-to-ground capabilities, an integrated advanced electronic warfare suite, advanced versions of air-to-air and air-to-ground weapons, and maintainability improvements. The two Tejas are part of the first squadron of 20 Tejas aircraft, thereafter another batch of 20 more Tejas aircraft with the same configuration will be ordered. Once 40 Tejas aircraft are fully operational and proven successful, an additional 80 LCA Mark-1 will be ordered with additional features. The modified LCA Mark-1 will have 43 improvements, most notably an AESA radar, which HAL will co-develop with Israeli firm Elta Systems; an air-to-air refueling facility; an externally fitted self-protection jammer to prevent incoming enemy missiles from homing in using radar signatures; and improvements in inertial, avionics and landing gear systems to resolve maintenance problems of the aircraft. Additionally, the improved LCA aircraft will have 27 modifications in a variety of subsystems to improve the maintenance performance of the aircraft.